In hostel-land, 3am can surely be known by no other name than the “going-to-the-toilet and major-league-farting hour”. Those whose evening had involved more than a couple in a nearby hostelry suddenly found their bladders in need of emptying, whilst those who haven’t, suddenly seem to act like they’ve done nothing but eat beans all evening. I was in a dorm in YHA Coniston Holly How hostel where eight of us were trying to sleep in a room designed for 12. I can’t recall when I last – if ever – slept in such a big room with so many people, but needless to say, it wasn’t the most relaxing night of the evening. Thankfully it wasn’t until around 6am when the synchronized snoring really kicked in. Well at least that was when I caught the SNAAARRRGGHHHHH, followed by a quiet follow-up snneerrrrrr. Oh and then there was the heavy snorer with obvious bronchial problems which resulted in a mid-sleep coughing fit, before immediately snoring again. However the highlight of the night was clearly the “Who will dare get out of bed first?” routine. From 7:30 onwards the creak of beds and rustle of people finding watches made it obvious people were awake, yet no one dared rise. Well okay, if that was true, I’d still be in a bed in the hostel. In actual fact it was me that drew the short straw. My breakfast was booked for 8am and there was no getting round it. As the clock slowly ticked towards 7:50 I just had to get up. By the time I returned 35 minutes later to wash and pack up, the room was pretty much deserted bar one solitary sleeper who was every an extremely heavy sleeper, or was wearing ear plugs. Slapping on the suncream, I prepared to head out on a lovely day for walking. True my boots may have still been damp from the day before, but it was neither too hot not too cold and there were no clouds to be seen. 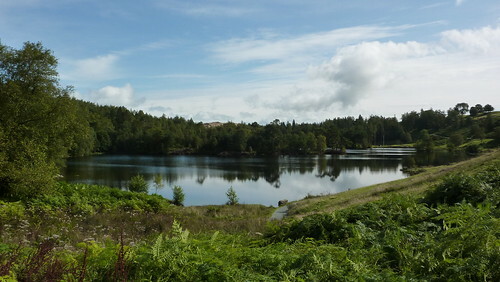 My cheery mood was furthermore increased on my arrival at the lovely Tarn Hows. This local beauty spot just seemed to place a big grin on my face and joy to my heart, even if the whole place was man-made – built after a stream was dammed to serve a watermill. Still, in celebration I unzipped the zips which converted my trousers into shorts, and ate an Eccles cake before heading on. 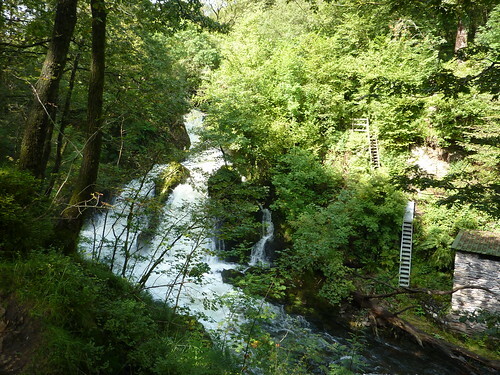 At the curiously named Tongue Intake Plantation, my guidebook recommended a detour in order to visit Colwith Force. Following a path of twisted tree roots and slippery rocks, this was naturally the point of the day I’d slip and land heavily on my arm, resulting in the air ambulance hoisting me away to safety before dispatching me back to London with a broken arm, my Cumbria Way dreams shattered and torn. Thankfully that happened in an alternate universe and an odd one at that as I was in a wood, so how the air ambulance was supposed to be able to find me I don’t know. Instead I got off with a slightly bruised elbow and the problem of how to get up right again whilst wearing a large, cumbersome rucksack. Despite the health and safety hazards, the detour was worth it and I was greeted by the hidden majesty of Colwith Force – a mighty waterfall now extra swollen by the rain. As I left I mused at how few people probably saw these lovely falls, only to spend the next hour continually saying “Good morning” to a parade of people heading towards them. The next waterfall of the day came nearby at Skelwith Bridge, where I got to admire Skelwith Force. It’s 5m drop was frankly nothing compared to its neighbour but the fact it was near a main road, had ample parking facilities and a series of footbridges so you could view the falls close at hand, resulted in a heavy stream of visitors. It was also where I’d planned on eating lunch – popular destinations often result in picnic facilities although in the end I munched my sandwich sat on a rock next to an attractive metal bridge. With my early lunch eaten and just four and a half miles to go until I’d done my days work of eleven, I set off towards Elterwater, fighting my way through the crowds of tourists on the busy riverside path, threatened with flooding in several places by the swollen River Brathaty which had burst its banks – in one area dramatically so, with a large patch of grassland becoming an impromptu lake. 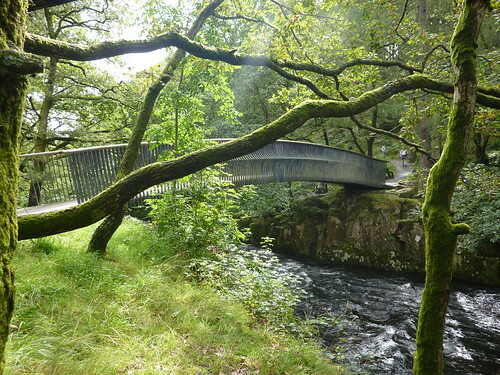 The easy going riverside path continued beyond Elterwater, and on to Chapel Stile where children frolicked merrily in the Great Langdale Beck as parents watched on. As I left, and passed by a campsite, the crowds slowly melted away and I was alone one more. The path became rocky and half flooded as it bounced along on the edge of hills. Stuck between two stone walls, the going was on the difficult side and slow, and frequently the only option was to just get the old boots even wetter. At long last I saw a sign proclaiming the New Dungeon Ghyll hotel was a mere mile away, meaning I had just two miles to go. But even then, the twisting, slippery path made it seem longer. My damp boots and socks were making my feet hurt, and I was convinced a blister was forming. Even when the New Dungeon Ghyll milestone was met, I still had to get to the Old Dungeon Ghyll, and the going wasn’t much better. Instead of being on the south side of the main road, I now found myself on the north – the Cumbria Way almost delighting in making this last section feel as long as possible. But at long last I found myself outside the latter pub. And early too. My plans had anticipated I’d arrive at this legendary pub around four, leaving me fifteen minutes to wait for the bus back to Elterwater. Instead I’d made it with an hour to spare, leaving just enough time for a pint – or indeed two as it turned out – before heading to the bus stop for the last bus of the day 16:15. I sat down in a seat and felt incredibly happy; a far cry from my mood the day before. 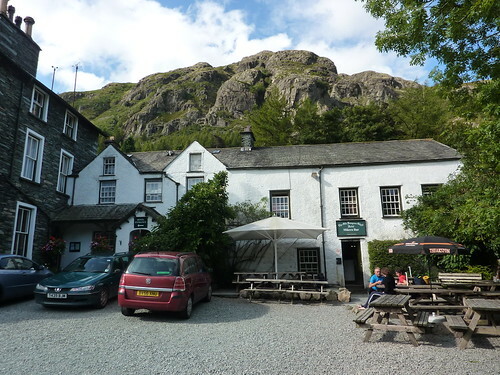 Back at Elterwater – its youth hostel being a cheaper option than paying £100 for a night at Dungeon Ghyll – I discovered with delight that this tiny hostel did evening meals and beer, and that my room mate would be the snoring-coughing guy from Coniston. Fearing I’d find him at Keswick the next day, I breathed a huge sigh of relief to find he was only going to Borrowdale the next day. After a nice meal of steak and ale pie and sticky toffee pudding, washed down my a bottle of Hesket Newmarket Brewery’s High Pike ale, I opted to take a turn round the village, which kept me occupied for what must have been ten minutes, after which I decided another beer was in order. 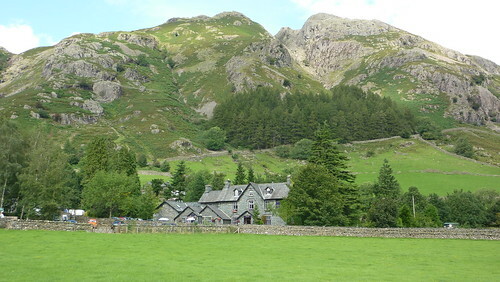 Conniston – YHA Coppermines to YHA Borrowdale is what I have planned. Is it a good trek or too much for a mother and daughter? We’re wanting to stay at hostels and si the plan. Next stopis Skiddaw House. Hi Susan – If you’re walking the Cumbria Way you’ll want YHA Coniston Holly How as it’s on the route. Coppermines is a bit of a walk away from the Cumbria Way. 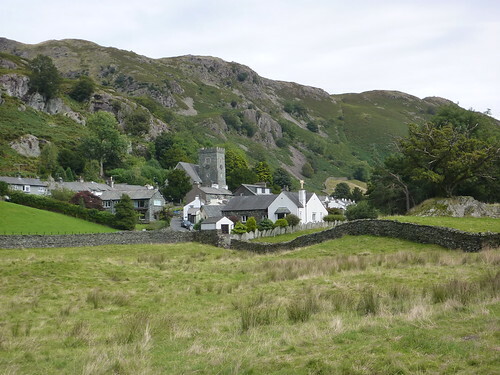 Coniston to Borrowdale is a long walk but doable in a day. First Published: 8 September 2009. Last Updated: 16 November 2014.